During the Fall of 2014, I started a 3-year program to become a classical homeopath. Shortly after that, I enrolled at Aromahead Institute to begin studying for aromatherapy certification. Shortly after that, I was told that aromatherapy and homeopathy cannot be used at the same time. I started to question what I was doing studying both things at the same time, expecting to practice them together. I’ve invested a lot of time and money into both learning about essential oils and homeopathy as well as the oils and remedies themselves. I became concerned that my world may implode! I asked my teacher, Dr. Les Moore the question in my homeopathy class about whether or not the statement that “aromatherapy and homeopathy cannot be practiced together” was true or not. After all, he knew I was studying both when I signed up and had never mentioned it (that would have been nice to know before I purchased all my books). He did say that homeopathic remedies and essential oils should be stored separately from one another. It is possible that a strong scent of an essential oil can cancel out the effect of a homeopathic remedy. However, he did not think that a person using aromatherapy could never also use homeopathy. Phew! I have always taken a truly holistic approach to my health. I have never considered one way as the only way. Over the years I have been to at least 11 chiropractors, over a dozen massage therapists, four acupuncturists, two naturopaths, two nutritionists, a Reiki practitioner and a reflexologist. Not to mention all of the traditional medicine doctors that I’ve seen. I know one thing for sure: no one person or practice has all the answers! And the best part is that no one should! I’d much rather have someone refer me to another practitioner than try their modality on me knowing that it probably will not work. My goal in studying aromatherapy, homeopathy, Reiki, and botanical medicine is that I will have several modalities to choose from. I also realize that there will be many times when I will recommend another therapy beyond what I can provide. My homeopathy teacher, Dr. Les Moore, makes a point to expose us to other alternative therapies so that we will have a good idea of whom to refer to when these situations arise. There is another component to the idea that homeopathy and aromatherapy cannot exist together and it lies in the phenomenon of the antidote. We traditionally think of an antidote as something that we want to use to reverse the effects of a poison. The first thing that comes to mind for me is an antidote to snake venom. If you are bitten by a poisonous snake, it’s handy to have the correct antidote on hand before paralysis or death occurs. The Merriam Webster Dictionary defines antidote as, “a remedy to counteract the effects of poison.” The fact is, that many homeopathic remedies are made from poison. Nux Vomica, for instance is the poison nut from the strychnine tree. If you were to eat one of these nuts, you would become gravely ill. Prepared homeopathically, Nux Vomica counteracts the effects of a hangover caused by overindulgence in food or drink, relieves morning sickness and indigestion, and may also help with depression and migraine headaches. The idea that the effects homeopathic remedies can be antidoted by coffee, makes anyone that wakes up with a cup of joe shy away from using homeopathy in the first place. The truth is that coffee can antidote some remedies, but it is not true for all remedies. You may have heard that if you are using homeopathy that you can never drink coffee. Dr. Moore calls this the “lazy” way to practice homeopathy. It is only sometimes true and most do not know how to find the information about antidotes so they use this general caution instead of doing some research. In the case studies we’ve done in class, we always take antidotes into consideration. In the case of coffee, we may just suggest they take the remedy more often to counteract the antidotal effect of coffee or other antidote. As far as “strong odors”, essential oils are only one way that those can occur. You could be driving down the street and get a whiff of the strong odor of a skunk so there is no way to entirely avoid strong odors. I look at these possible antidotes as something to be aware of. If you notice that a remedy is working and then it is suddenly not working, it’s good to be aware of any strong odors you may have recently experienced. Re-dose with the homepathic remedy and avoid that strong smell to give the remedy time to work. If you smell it again, then give another dose of the homeopathic remedy. Boericke’s New Manual of Homeopathic Materia Medica with Repertory has a “Relationship of Remedies” section in the back of the book. This section contains a table that lists complementary remedies, remedies that follow well, inimicals, antidotes, and duration of remedy. Inimicals may be even more of a concern, since they are contraindicated to be taken in conjunction with another particular remedy as their actions may oppose or antagonize each other. That, however, will be for another day: this article is about antidotes. 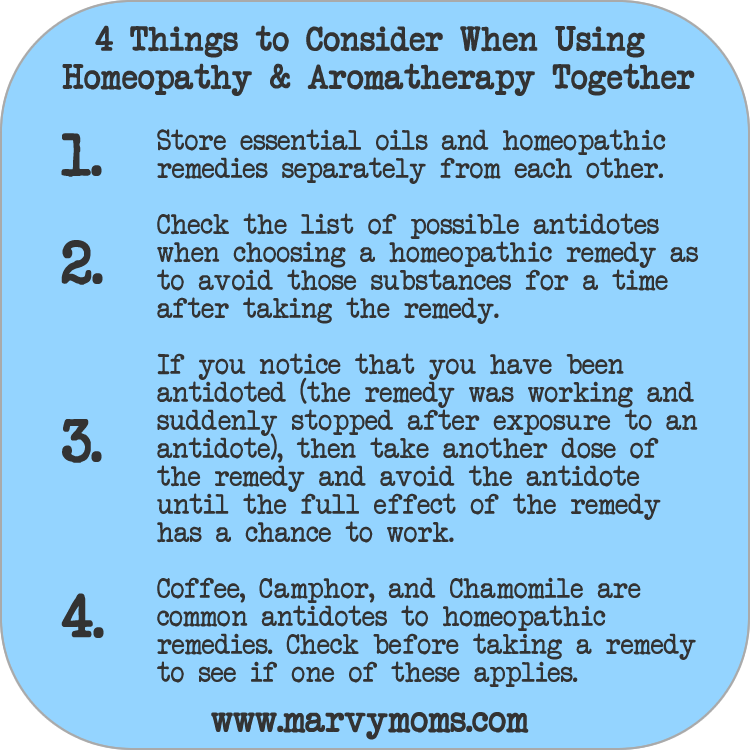 Below is a list of some common homeopathic remedies and their antidotes. Refer to Boericke’s New Manual of Homeopathic Materia Medica with Repertory for a complete list. There is a complete list of essential oils containing more than 1% camphor in Essential Oil Safety Second Edition by Robert Tisserand and Rodney Young. Homeopathic coffee (coffea/Coff.) is a useful remedy for insomnia with a mind that won’t shut off. If you are taking this remedy, keep in mind that while there are remedies that antidote coffea, they are not as many as coffea is an antidote for. Antidotes for coffea include: Acet-ac., Acon., Cham., Chin., Grat., Ign., Merc, Nux-v., Puls., and Sulph. I have used ignatia (Ing.) and coffea (Coff.) at the same time with success by taking ignatia in the daytime for anxiety and coffea at bedtime to help me to sleep. This was on a short-term basis for a specific life situation and did a great job of getting me through a tough spot. I was also using a 2% dilution of lavender and frankincense essential oils at bedtime and still everything worked. Store essential oils and homeopathic remedies separately from each other. Check the list of possible antidotes when choosing a homeopathic remedy as to avoid those substances for a time after taking the remedy. If you notice that you have been antidoted (the remedy was working and suddenly stopped after exposure to an antidote), then take another dose of the remedy and avoid the antidote until the full effect of the remedy has a chance to work. Coffee, Camphor, and Chamomile are common antidotes to homeopathic remedies. Check before taking a remedy to see if one of these applies. What homeopathic remedies and essential oils have you used at the same time with success? Which ones have you found to not work well together? Great article! 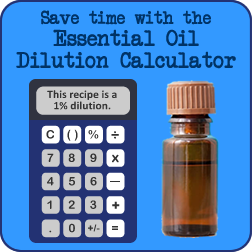 I do have a question about the duration of time I should wait before using an essential oil after taking a homeopathic remedy. I know it’s not set in stone, but personally, what’s your general rule of thumb? Great question, Nancy! It really depends on the remedy. If I’m having an especially hard time turning off my brain at night then I will take homeopathic coffea cruda as well as use one of my essential oil sleep blends. I also know of someone taking a single dose of lachesis as a constitutional remedy and having it work well for them until they had a single cup of coffee weeks later. Generally, it’s recommended that you not have anything by mouth (food or drink) for 15 minutes before or after taking a remedy, so that might be a good place to start. I’ve forgotten this many times and had water too soon and the remedy still helped. And remember, not every essential oil (or strong smell) will antidote every homeopathic remedy. Depending on the situation, there may be no issue at all. So, no simple answer here. Experiment and see what works for you. Is it the smell or the actual exposure to the essential oil that causes the antidote? I have makeup that has rosemary extract in it, but you can’t really smell it- it isn’t like having it in a diffuser or something. Would this still antidote potentially? Just having it on the skin? Thank you! It really depends on whether or not rosemary is an antidote for the specific remedy you are using or not. Strong odors can be antidotes, however, if the scent of rosemary were that potent, you would likely not even want to wear the makeup. If you notice that a remedy is effective until you apply your makeup, then you may want to consider not using the makeup for awhile or redosing more frequently, but I’m guessing you are just fine. Hi, Emily! I love this post. I just took some lachesis this morning for a sore throat and 45 minutes later had my morning coffee with some honey in it. About an hour later I realized I probably antidoted the lachesis with the coffee (and it was confirmed with I checked Boericke) and was searching online to see what I could do. I happily stumbled on this post from my very talented classmate. 😉 Thanks so much for sharing this. I’m going to wait a while for the coffee odor and flavor to diminish and then take some more lachesis. Hi Marium! Yes, coffee is definitely an antidote for Lachesis. How cool that you found this article 🙂 Be sure to share your story with us in class next month! Thank you for this highly insightful article. It definitely cleared up some confusion, however I am so disappointed to know chamomile is a common antidote. I’ve given my daughter homeopathy many many times followed by a cup of chamomile tea before bed. No wonder it didn’t work so good. Wish they would disclose all this info on the bottle! !